A shampoo recommended for breeds with wire coats such as Schnauzers, Terriers, etc... or breeds requiring volume (Poodle, Bobtail, Kerry Blue,...). A very mild shampoo, ideal for sensitive skins or frequent washes. It's antiseptic relaxing properties produce balsamic effects on skin. 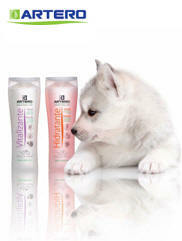 A shampoo designed for the care of white, black and grey coats intensifying natural color. It's soft, tensoactive properties along with the gentle shade of the product, help clean and leave the coat looking bright and shiny. A shampoo ideal for all breeds. With its emulsion effect, it eliminates dirt with maximum respect to the skin and coat. Ideal for day to day use in the salon. For white, black, grey and brown coats. Completely enhances the natural color. Produces shinny and bright results. Very concentrated product for use after shampooing. Do not use directly on coat, apply a small amount in hand, rub hands together and when white cream appears, massage gently into hair. Note: Do not leave in hair more than 3 minutes. 100% effective (when used as directed). This special shampoo recommended for use between shampoos or when the animal is unable to come into contact with water. The components of this formula absorbs excess oil and eliminates the dirt and bad odours of the coat, leaving it soft, clean and perfumed instantly. This product works to repair the coat with silk protein, It contains Pro-Vitamin B5 which contributes to the natural shine of a healthy coat & adds elasticity & flexibility while preventing breakage. A conditioner that instantly restores the softness and shine of natural hair, achieving a silky, easy-to-brush look. Keratin regenerates damaged hair and by adding more weight, it hangs better and increases the hair�s straightness. The careful selection of it's components gives a non-greasy, conditioning effect which allows it's use as a softner on a dry coat, giving it a shiny invisible film that prevents tangling and helps bushing. A dry particle spray that can be used for fixing or texturizing any style. Allows free movement of the hair, and is imperceptible to the touch. Can be used on all colours/tones of hair. Artero Podium Dry Hold is the perfect finish for all breeds, especially terriers and also for topknots. Does not leave residuum in the hair. Perfect for fixing a topknot, especially in shows, expos, etc. Use on clean coats. For an antistatic / anti fuzz effect spray sparingly over coat, then brush in the natural direction of the hair. To create volume, generously spray over coat and then back-comb (against natural direction of hair). Ideal for use while cutting. Instantly cools down blades resulting in a longer lasting cut. 100% Designed & created exclusively in Barcelona. 100% Special Polyester (Very fresh and breathable material).